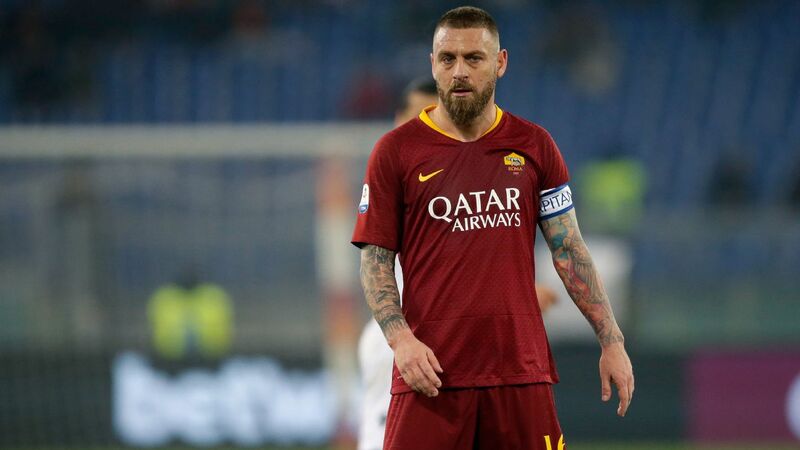 AS Roma's dramatic Champions League elimination by Porto, thanks to a late penalty awarded with a VAR review, was a "terrible way to go out," their captain Daniele De Rossi said on Wednesday. Daniele De Rossi has said Roma must focus on following up their run to the Champions League semifinals with more of the same next season. Roma lost 7-6 on aggregate to Liverpool despite winning 4-2 at the Stadio Olimpico on Wednesday, and have a four-point lead over Inter Milan in the race for a top-four finish and Champions League football next season. And Roma captain De Rossi wants them to use this season's European exploits as a springboard for more success. Roma came within centimetres of striking a huge blow in the race for the Champions League after bashing the woodwork twice in Sunday night's Rome derby, with Edin Dzeko cursing his luck as his injury-time header thumped off the bar just as the Curva Sud was preparing itself for another night of wild celebrations following Tuesday night's Barca battering. Roma made it through to the Champions League semifinals for just the second time in their history after an incredible, magical night at the Stadio Olimpico that will live long in the memory of those who were lucky enough to be there. Looking down and out after losing the first leg 4-1, Roma pulled out a era-defining display that saw them deservedly dump out Lionel Messi and Barcelona following a 3-0 victory. Roma's European dream came to an end at the hands of a Barcelona team that is so clinical it doesn't even need its own players to shoot to score four times and sink a tie in the first leg. Two deeply unfortunate own goals either side of half-time from Daniele De Rossi and Kostas Manolas put the spirited Giallorossi on the precipice and when Gerard Pique tapped home the third Roma were left with one foot out of the competition.